B 40 W Dose (disc) 1533210214 https://www.kaercher.com/hk/professional/floor-scrubbers-scrubber-dryers/scrubber-driers/walk-behind-scrubber-driers/b-40-w-Dose-disc-1533210214.html Walk-behind scrubber drier (40 l). Configuration example with traction drive, disc brush, 51 cm working width and battery (105 Ah). Walk-behind scrubber drier (40 l). Configuration example with traction drive, disc brush, 51 cm working width and battery (105 Ah). B 40 W Bp walk-behind scrubber drier. With brush head and disc brush, 51 cm working width, maintenance-free battery (24 V, 105 Ah), variable traction drive (forward and reverse) and KIK key system for protection against incorrect operation. Extra feature: eco!efficiency mode extends battery life, tank rinsing system for automatic cleaning of the dirty water tank without splash-back, auto-fill function for convenient filling of the water tank as well as Dose cleaning agent dosing system for direct dosing from the cleaning agent container. Tip: configuration example. This machine is available with a range of different equipment and features, e.g. different batteries, cable version, without traction or with 43 cm working width. Battery types: maintenance-free 70 Ah (C5), low-maintenance 80 Ah (C5) or maintenance-free 105 Ah (C5). Also available as a mains-operated version. Time-saving filling of the fresh water tank. Filling via the fresh water hose stops automatically when the tank is full. Simple brush replacement in seconds: unlocking the brush via foot pedal, locking by lowering the machine or clipping in manually. For significantly reduced energy use and substantially longer battery runtime. The eco!efficiency mode is extra quiet and optimal for noise-sensitive areas (such as hospitals or hotels). Optionally with traction drive. Infinitely variable forward and reverse operation. The maximum speed can be preset. 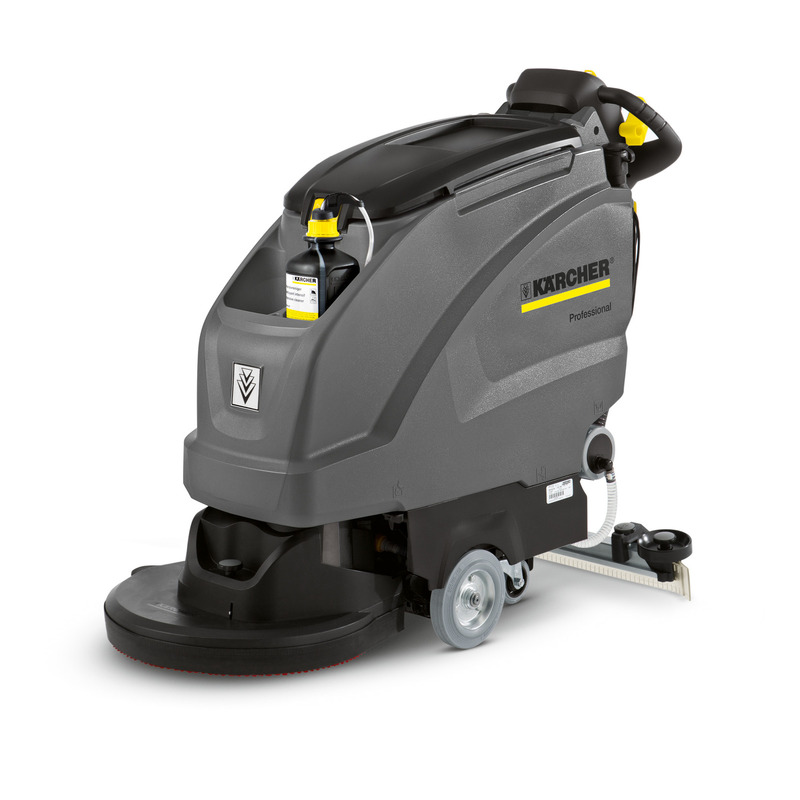 Brush heads, squeegees, mains or battery operation and additional equipment details are freely selectable. Yellow key for operators, grey key for supervisors. Reduced service costs thanks to less operating error. The slim machine can be easily manoeuvred, even in tight spaces. The asymmetric shape of the machine provides a clear view of the surface to be cleaned. Maintenance-free battery set consisting of 2x 12-V batteries and connecting cables. The Homebase Mop kit contains mop clip, mop support and bottle holder – the perfect solution for securely carrying a mop directly on the scrubber drier.